Skillful Etchings; Surrealistic Figures and Playful Compositions. The Ukrainian Institute of America in collaboration with ArtFira.com present 'Art-Chemistry - skillful etchings; surrealistic figures and playful compositions' - a solo exhibition of Oleh Denysenko. 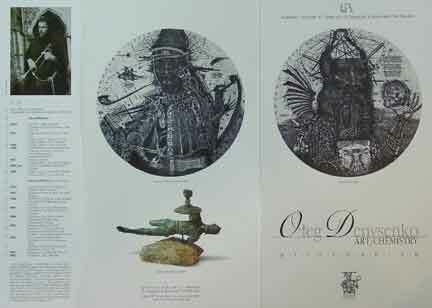 Oleh Denysenko is one of a few Ukrainian printmakers to attract international interest. His etchings are found in prestigious museums of Poland, Belgium, and the United States and in the catalogues of international print exhibitions in Sweden, Norway, Slovakia, Japan, Great Britain, and Germany. In the artist's etchings even an amateur observer recognizes a profound intellectual exercise preceding the actual engraving process. The etchings are engraved into copper and zinc plates without haste and then transferred to a dampened sheet of Hahnemühle paper. The plates used for the print leave a stamp of time on paper. It is to the artist's skill and persistence to overcome the resistance of metal plate with etching tool and drypoint. The technique requires perfect concentration and complete devotion. Oleh Denysenko's first love and dream was archeology - the science of seekers of treasures which, when they mature, store pictures of the past. The past attracts us by its mysteries; there is always a temptation to uncover them. If we tried to geographically locate Mr. Denysenko's Muse we would find her somewhat in the middle of the waters of North Sea, its bed that is strewn with shipwrecked sailing boats, spilt coins, jewels, and old weapons. The profiles of artist's numerous etchings are full of love for the past, for numismatics, for the classic form. They are precise and sharp like an old Roman coin. Inspiration for etchings also comes from old Northern Renaissance as well as Baroque masters. 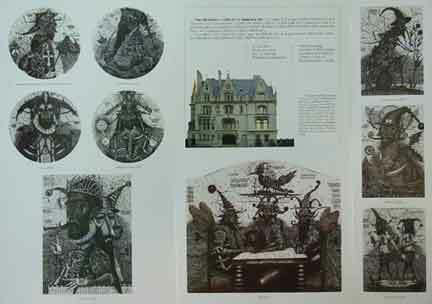 In technical elaboration and construction of pieces we feel the presence of Leonardo da Vinci ('Eternal Fly'), in mannerism - Giuseppe Arcimboldo ('Fancy'), in surreal settings - Hieronymus Bosch ('The Great Dreamer'), and in technical virtuosity - Albrecht Durer, Peter Brueghel the Elder and Rembrandt van Rijn, the great printmakers. Our reality without mystery is one-dimensional and it would be such without eccentric artwork of Oleh Denysenko.